WE BOUGHT A ZOO is Cameron Crowe's first film since the mawkish, embarrassing ELIZABETHTOWN, and I'm afraid that it's another flabby sentimental film in which the central characters do not hold our interest. 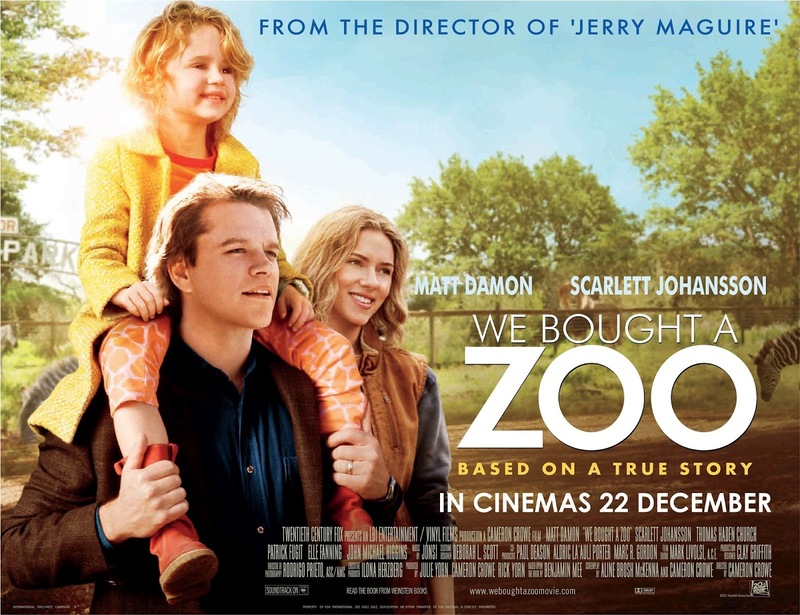 Based on a script by Aline Brosh McKenna (27 WEDDINGS) the movie sees a recently widowed journalist pour his family's money into a neglected zoo. Everything is utterly predictable. There's an angry exchange that provides catharsis for the father and his teenage son. There's flirtation with bankruptcy before a triumphant reopening of the zoo. There's a mean government inspector, a cute vet love-interest for the dad, a cute vet's niece love-interest for the son, and an attempt to put some bite into the mix with a sarcastic older brother. The material is hokey as hell, but I couldn't help wonder if different casting might have helped - and direction toward broader humour. Perhaps Ben Stiller and Amy Adams as the father and vet rather than Matt Damon and Scarlett Johansen? I despair that Crowe will ever again direct anything with the emotional depth, narrative sophistication, dark undertones, and genuine heart (as opposed to manufactured schmaltz) of ALMOST FAMOUS. WE BOUGHT A ZOO was released in winter 2011/2012 and is now available to rent and own.